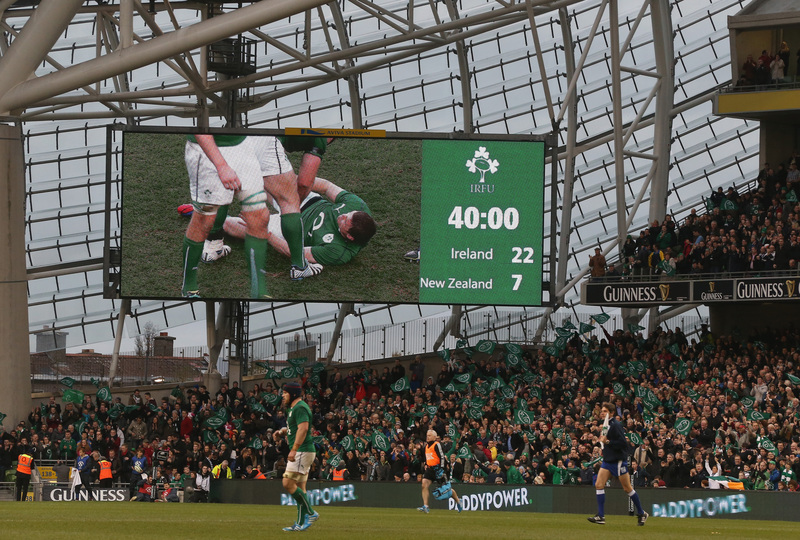 during the International match between Ireland and New Zealand All Blacks at the Aviva Stadium on November 24, 2013 in Dublin, Ireland. Admit it, who has uttered the cliché “you can never tell which France is going to turn up” this week? You should be ashamed of yourselves. By selecting just nine backs including 120-kilogram barrel Mathieu Bastareaud in his 23 to face England, Phillipe Saint-André is hardly playing his cards close to the chest. Put simply, it isn’t going to be pretty if Les Bleus have their way. On a stodgy surface at the Stade de France, the hosts’ pattern will be painfully simple: manic race to the gain-line, eye-watering midfield collision, ferocious blender of a breakdown, repeat. It’s a trend that could become very familiar over the course of this Championship and will be easy to indulge in, especially given the power of most packs on show. However, more ingenuity is essential for northern hemisphere nations on the road to 2015. Take England, for example. As if they need further reminding after almost 11 months of sweat-inducing nightmares and questions on the subject, their last Six Nations match was that defeat in Cardiff. Defeat is a kind way of describing what went on at the Millennium Stadium that evening. It was nothing short of a massacre – a rout by an inspired side in red that obliterated Chris Robshaw’s designs on a Grand Slam and left some deep, deep psychological scars. 16 March, 30-3: a date and a scoreline Stuart Lancaster will never forget. Luckily, the former schoolteacher has heeded some painful lessons. He knows back-row balance is vital. The emergence of carrying No 8s Billy Vunipola, Sam Dickinson and Dave Ewers, plus Ben Morgan’s return to form, means his flankers can operate with freedom. 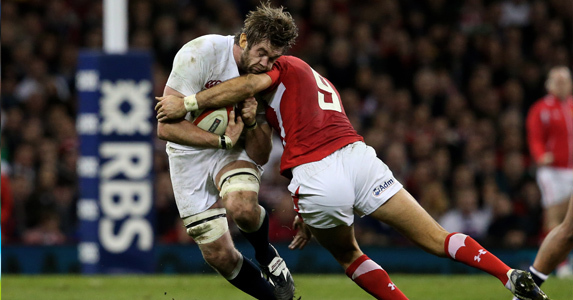 Never again will cracks be papered over by deploying Tom Wood at the anchor of the scrum. Positive results are there for all to see – the same team run ragged by Sam Warburton and Justin Tipuric rendered Michael Hooper anonymous in November. Another big work-on was territorial awareness. Opposite Wales’ crowding line-speed, dallying in possession behind the half-way line was suicidal. Physicality and athleticism have been heightened with the presence of Courtney Lawes alongside Joe Launchbury, meaning both scrum and lineout should produce solid platforms. Most encouraging of all though, is Lancaster’s commitment to attacking talent. Yes, Owen Farrell’s point of difference is pragmatism, but the decision to start Jonny May, Jack Nowell and Luther Burrell in Paris – not to mention tempo-merchant Danny Care – suggests a focus-shift. Even without Manu Tuilagi, Christian Wade, Marland Yarde and Ben Foden, scoring tries is a clear priority. It’s refreshing. Whisper it – on second thoughts perhaps stay silent in Celtic company – an English clean-sweep is far from unthinkable if this weekend’s Channel-hop is victorious. Although a tradition of post-Lions tour success and the magical Wesley Fofana mean France cannot be discounted, the two likeliest challengers are Ireland and hat-trick hunting Wales. And they must come to Twickenham. That said, HQ will not daunt this pair. They have the tools to overrun any fortress. The excellent Joe Schmidt has had time to instil his free-flowing philosophy and works with such exacting attention to detail that Ireland’s skills will be razor-sharp when expansive rugby is required. You need only look at Ulster’s relentless kick-chase, Munster’s mettle, Leinster’s muscle and Connacht’s tenacity to be assured the men in green can thrive as a defensive force too, even without Sean O’Brien. If the Wolfhounds’ performance at Kingsholm last weekend was anything to go by, Schmidt’s is a hungry set-up determined to banish the pain of last year and prove that a wonderful first half against New Zealand can be the norm rather than a glorious exception. Now to Warrenball. Many expect nothing new about Wales’ approach and have an educated hunch that Mr Gatland’s well-worn method of round-the-corner mayhem will take precedent. Certainly, the settled match-day 23 to face Italy in the tournament opener could implement that game plan in its sleep. One man could bring another dimension though. Scott Williams is set to wear the 13 shirt while Jonathan Davies makes the final strides back to full fitness. He is far more than a stop-gap. In the same way Ma’a Nonu’s personal development from a crash-ball dummy to a well-rounded fotballer coincided with the All Blacks inexorable rise, Williams can usurp Jamie Roberts and elevate Wales past predictability into genuine World Cup contenders. All the physical attributes are there and his distribution make him arguably the best man to release Leigh Halfpenny into the outside centre channel – an underused but awesome weapon. This Six Nations will be about imperfections – no side is at full strength and most have a lot of tinkering to get through over the next 18 months. Sergio Parisse and Alessandro Zanni will be in the Italian trenches looking to eke out results as they managed so gallantly last year, while a major challenge for Scotland is to unleash Stuart Hogg and Sean Maitland – two of the competition’s most accomplished runners. Northern hemisphere rugby isn’t short of grunt. In grim conditions on some irritatingly poor pitches, that can be enough to win games. But unerring guile will spark teams at the business end of 2015. Now is the perfect time to hone those qualities.